Ohio’s rock event of the summer is back! The three-day Inkcarceration 2019 Music and Tattoo Festival will take place July 12-14 featuring headliners Shinedown, Godsmack and Five Finger Death Punch. Tickets are on sale now for the second annual Inkcarceration Festival on July 12, 13, and 14 at the famous Ohio State Reformatory aka Shawshank prison in Mansfield, Ohio. The event will feature over 30 bands on two outdoors stages, 70 tattoo artists, reformatory tours, gourmet food, drinks and more! 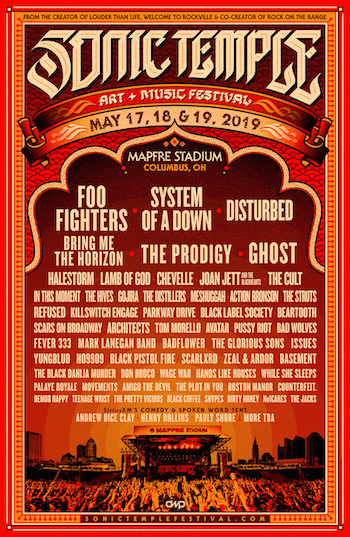 The amazing lineup also includes Live, Taking Back Sunday, Seether, Skillet, I Prevail, Starset, Red Sun Rising, Motionless in White, Fozzy, Buckcherry and lots more! Be sure to get your tickets at the Inkcarceration 2019 festival website. BROUGHT TO YOU IN PARTNERSHIP WITH INKCARCERATION 2019.